So most of you have already heard that we had a interesting weekend. It all started when Tyson started filling sick to his stomach Thursday night about 9:30. He decided to just go to sleep and hope that it would go away and that he'd fill better in the morning. Little did we know what was about to happen. Tyson was up most of the night because he as unable to sleep due to the pain he was feeling. During the night the pain in his stomach started to settle in his lower right side. At 4:00 in the morning he woke me and we thought we should take off to hospital. Not sure really what to do we called Tyson's brother Jason and we were advised to go to the emergency room. Once in the E.R. they ran blood tests and took x-rays, as well as answered a very lengthy list of questions over and over again. The doctor finally showed up at 6:00 and said that it was probably appendicitis. They moved Tyson upstairs and we waited for the surgeon to get in because we needed him to okay it. At about 8:00 Dr. Christensen came in and went over the list of questions again and said it was definitely appendicitis. Dr. Christensen had one surgery to do first and then he was going to take Tyson it as soon as possible. They took Tyson into surgery around 9:00 and he was in surgery for about an hour. Everything went well and Tyson is healing nicely. They had him spend the night and we were able come home at about 11:00 Saturday morning. Tyson in his hospital bed. The drugs made him quite loopy and completely out of it. He slept most of the day Friday. We decided to do the laparoscopic appendectomy so Tyson has three little incisions instead of one large one. This way is suppose to have less scaring and heal faster. During the surgery we had them take pictures for our two medical student brothers to see. 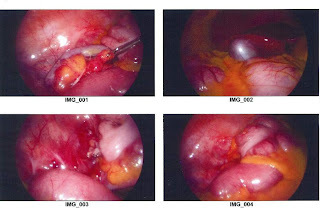 In the first picture you can see the appendix, it's the long purple thing. Usually appendix are small, about the size of a earth worm, and really pink; Tyson's was as big around as a finger and had started to turn purple. In the second picture you can see the gal bladder and the liver. I'm not quite sure what the third picture is. The forth one is of the large intestine after the appendix was removed. We'd like to say thanks to everyone that helped us out this weekend. We really appriciate the thoughts and phone calls. We love you all!!! Hey there! I ran across your blog and thought I would say hi! You guys look so cute, sorry your hubby isn't feeling well! Crazy! I hope Tyson gets feeling better! And I love the back to school post, pretty funny! Hope you guys are doing well. Love you both! !